Such a pretty quilt! Merry Christmas! Merry Christmas Nanette! I just love your Vintage Holiday quilt! I'm super happy I made mine at the last minute too! 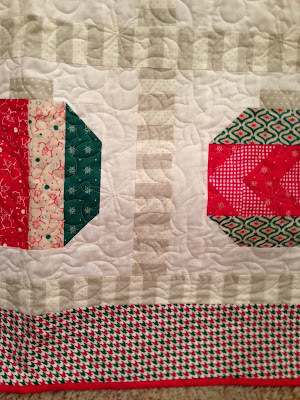 Your Vintage Christmas quilt is so pretty Nanette! You can leave it out until July at least. Love your quilt, Nanette - hang it as long as you wish! To you and yours, blessings all around! A Christmas tree full of roses to you too, Nanette! Hope your holiday is full of everything you love best about the season. 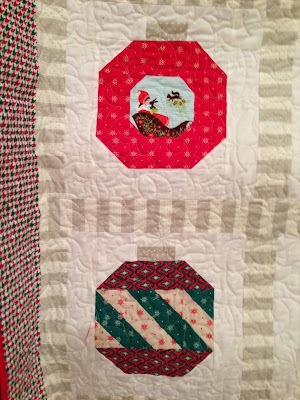 Love your vintage ornaments quilt too. You are right, the striped sashing is fab! Nanette, I really enjoy your blog! Merry Christmas to you, too! All the images are looking mind blowing. Merry Christmas Nannette. Your quilt is beautiful. Didn't get to my Christmas quilt this year. Sniff. This time you share great quilts thanks again. Great quilt for Christmas! Wishing you and your family a Very Merry Christmas! Thank you so much for the lovely Christmas wishes. I love the thought of a Christmas tree full of roses. Have a wodnerful Christmas and this year two beautiful granddaughters to share it with!! Merry Christmas to you and your dear family. Lovely quilt! Have a wonderful Christmas with your family! Merry Christmas, Nanette! The quilt is wonderful!! Merry Christmas! I love how your quilt turned out. What is the border fabric? It is perfect! Merry Christmas Nannette, to you & yours! Thank you for inspiring me always with each visit to your blog. Your Vintage Christmas quilt is fabulous! The quilt is beautiful!!! Merry Christmas to you and your family. I vote for keeping it out til at least Valentines Day! I'm keeping my big tree up all year. Need that Christmas spirit big time, plus I have a plan for projects with my daughter. If I put the tree away it is "out of sight, out of mind". Don't want that! Here's wishing you and all your family a lovely, peaceful Christmas!! 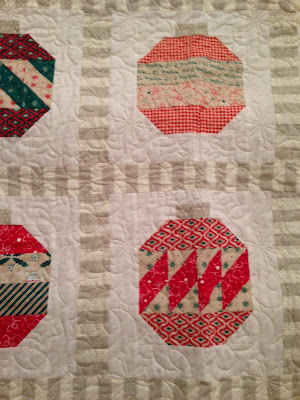 Your Christmas ornament quilt turned out so beautiful and has a very vintage feel to it! Quilting is gorgeous! Your Christmas ornament quilt is gorgeous! The snowflake quilting really adds to the effect. And Merry Christmas right back to you, my friend! Hope you've had a lovely Christmas. Best wishes to you and your family in the New Year - may many blessings come your way. I really love this one and the colors are a nice break from the lime/aqua/pink/red Christmas fabric colors lately...not that they aren't both lovely but it is nice to see a something fresh and different! You matched fabric to pattern perfectly! 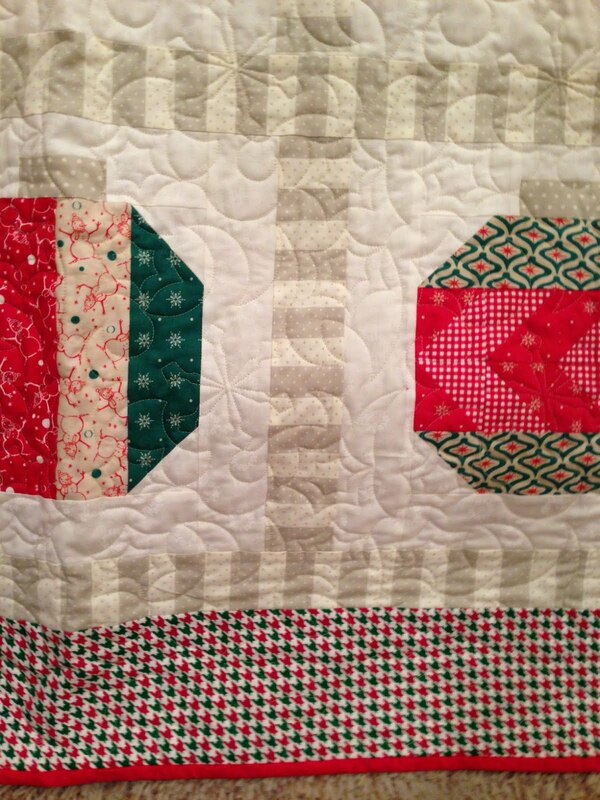 I love your vintage Christmas quilt.. So sweet! Hmmm, now I wonder if this is one of your patterns??? Happy Happy Belated Nanette! I hope you had a WONDERFUL Christmas! 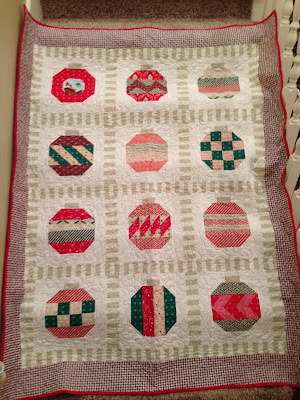 Your quilt turned out beautifully -- LOVE that sashing!!! I see I've missed a lot of wonderful posts in the last few months. I look forward to catching up and visiting in the new year. Best wishes for a wonderful 2013!